The Melbourne Athenaeum was founded in 1839 as the Melbourne Mechanics' Institution. Its purpose was "the diffusion of literary, scientific and other useful knowledge to members and the general public" and this was achieved by maintaining a library, museum and reading room, and offering classes and lectures. Much of Melbourne's standing today as arguably Australia's cultural capital can be traced back to the Athenaeum, this building and the role it played in the early promotion and development of music, visual arts, literature, science and theatre. The Athenaeum's first tenant, in 1843, was the Melbourne City Council, which held meetings here while the town hall was built. The Athenaeum Hall was the venue for public meetings, balls, entertainments, and many lectures, including by Mark Twain and Sir Redmond Barry. The first feature film, The Story of the Kelly Gang, was premiered, as was the first 'talkie', The Jazz Singer. The building housed Victoria's first art gallery and the stage of the Athenaeum Theatre has been graced by such luminaries as Dame Nellie Melba, Sir Laurence Olivier and Barry Humphries. The Melbourne Theatre Company called the building home for many years and, today, the theatres are venues for the Melbourne International Comedy Festival and Melbourne Opera city performances. 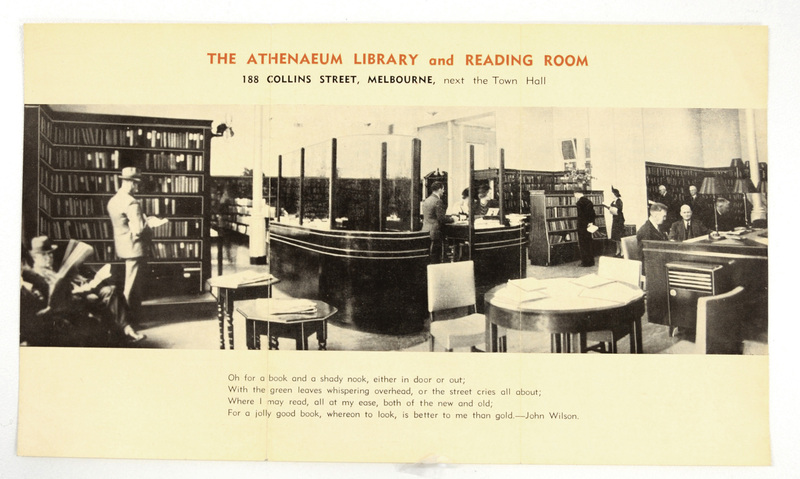 Throughout its life, the Athenaeum Library on Level 1 has provided Melburnians with access to a hand-picked collection of books and reading material. Today the library holds a 30,000-strong collection and hosts regular events, talks, book clubs and a screen club. It provides a warm, inviting reading room to relax in the heart of the city, and payment of an annual subscription allows you to become part of this extraordinary institution, part of Melbourne's history. For more information about the history of the Melbourne Athenaeum visit our Archives Website.